Limerick defeated Wexford by 2-23 to 0-15 in the Allianz Hurling League Division 1B on Saturday February 13th at the Gaelic Grounds Limerick. LIMERICK (HL v Wexford): N Quaid (Effin); T Condon (Knockaderry), R McCarthy (Blackrock), R English (Doon); D Morrissey (Ahane), D Byrne (Patrickswell), S Hickey (Murroe-Boher); J Fitzgibbon (Adare), P Browne (Bruff); D Reidy (Dromin-Athlacca), G O’Mahony (Kilmallock), C Lynch (Patrickswell); T Morrissey (Ahane), D Hannon (Adare), B Nash (South Liberties). This entry was posted on Saturday, February 13th, 2016 at 12:00 am and is filed under events, News. You can follow any responses to this entry through the RSS 2.0 feed. Both comments and pings are currently closed. 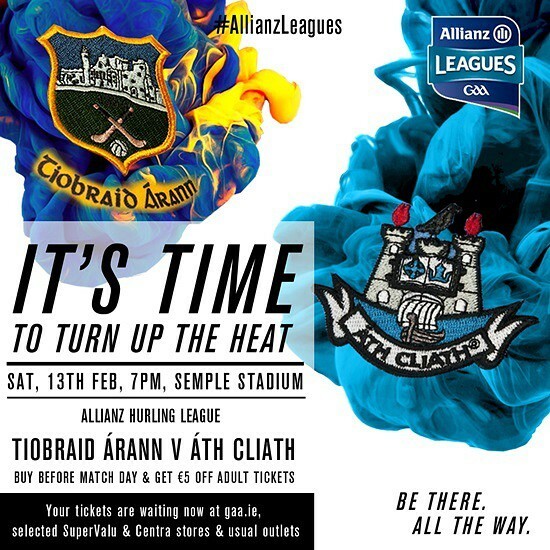 Tipperary defeated Dublin by 1-23 to 0-12 in the Allianz Hurling League Division 1A on Saturday February 13th at Semple Stadium Thurles. Tipperary crushed Dublin by 14 points in Thurles this evening to signal their Allianz Hurling League Division 1A intent. Michael Ryan’s first competitive game in charge of the Premier County resulted in a big Semple Stadium win. Tipp may have opted out of the pre-season Munster Senior League but were quickly into their stride against the disappointing Sky Blues, with Jason Forde hitting 1-5 from play in front of 5,105 spectators. For Dublin and their manager Ger Cunningham, this was a setback following Walsh Cup glory as Tipp dictated the terms of engagement right from the start. Tipp had the breeze at their backs in the opening half and wasted no time getting down to business. By half-time, the hosts were 1-9 to 0-3 clear and Forde hit the 13th minute goal, breaking onto loose ball before firing a low strike past Conor Dooley, who had done brilliantly within the first 25 seconds to keep out John McGrath. A new, direct approach from Tipp was evident but they spoiled much of their good work by registering 10 first half wides. Still, Tipp had the scoreboard ticking over with regularity as Dublin struggled to create much.Paul Ryan, whipped off at half-time, sent a couple of scoreable frees wide while other efforts from teammates dropped short. Noel McGrath, starting a competitive game for Tipp for the first time since his successful battle with cancer last year picked off a gorgeous first half score on a night when his brother John also did well. Scorers for Tipperary: J Forde 1-5, J McGrath 0-7 (5f), C Kenny & J O’Dwyer 0-3 each, Pádraic Maher & N McGrath 0-2 each, D Fitzelle 0-1. Scorers for Dublin: D Treacy 0-3f, N McMorrow 0-2, D Plunkett, E Dillon, D O’Callaghan, P Ryan (f), M Schutte, D O’Connell & C Cronin 0-1 each. Subs: D Fitzelle for Patrick Maher (47), J Gallagher for Breen (58), J O’Dwyer for McCormack (58), J Meagher for B Maher (66), L Ryan for Quinn (67). The Tipperary Senior Hurling panel selected to take on Dublin in their opening Allianz Hurling League Roinn 1A fixture in Semple Stadium this Saturday night, February 13th at 7pm has been announced by manager Michael Ryan. Michael has handed starting league debuts to Daire Quinn from Nenagh Éire Óg who lines out in midfield and also to Dan McCormack from Borris Ileigh who starts at right half forward. The McGrath brothers Noel and John line out together once again since both last made joint appearances in last year’s league. C Dooley (Ballyboden St Enda’s); J Boland (Na Fianna), C O’Callaghan (Cuala), O Gough (Cuala); E O’Donnell (Whitehall Colmcille), C Crummey (Lucan Sarsfields), S Barrett (Na Fianna); N McMorrow (Ballyboden St Enda’s), J McCaffrey (Lucan Sarsfields); D Plunkett (St Brigid’s), E Dillon (Naomh Fionnbarra), D Treacy (Cuala); P Ryan (Ballyboden St Enda’s), D O’Callaghan (Ballyboden St Enda’s), M Schutte (Cuala). 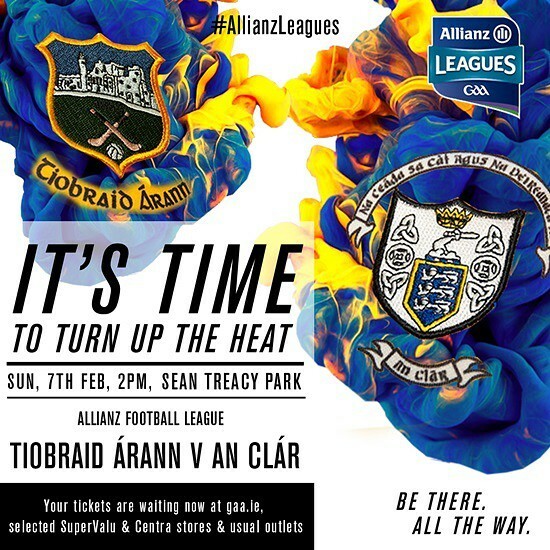 With their opening Allianz Hurling League Roinn 1A fixture against Dublin just three days away, the Tipperary Senior Hurling panel and management team are looking forward to the commencement of the 2016 AHL. This is the first of the National competitions this group have the opportunity to compete in and team preparations have been good in advance of the start of the new season. Tipperary management have a hardworking, committed bunch of players who are all looking for opportunities to play at this level where the ambition is to qualify for the Quarter-Final stages of the league after the 5 game series. With the demands of the league intense, every player in the training squad is a key figure in the overall success of the unit. That said, Michael Ryan’s side have some injury concerns which will impact on availability of the following players – Seamus Callanan will be out for a further couple of weeks, Conor O’Brien will be out for 3 weeks, Kieran Bergin will also be out for 2 weeks while new panelist Sean Curran has suffered a medial ligament injury which will result in Sean missing the entire League. A panel of 26 players for the opening game against Dublin in Semple Stadium this Saturday night, February 13th, will be announced on Thursday night and this then will be reviewed before each Allianz Hurling League game.